Handmade Beds - Discover our Pride in Craftsmanship that Lasts | Harbor Springs Mattress Co.
Old world craftsmanship is key in every step of our mattress making. From start to finish in our Harbor Springs Michigan workshop good music plays while our craftsman take their time to hand cut, hand layer, hand tuft and hand sew. Our craftsmanship and the finest natural materials result in the best possible sleep for as long as possible. We start making your mattress only after you place your order. With Harbor Springs Mattress Co., you will always know the bed you are sleeping on did not come from sitting in a warehouse. Rather, it will be made fresh just for you and you alone. “He who works with his hands is a laborer. He who works with his hands and his head is a craftsman. At Harbor Springs Mattress Company, we went in the opposite direction of mass production. Each mattress is hand built with an impressive inner spring unit. Layers of pure cotton, wool and natural latex are first hand cut, then hand tufted to the inner springs while the springs are compressed. Additional natural comfort layers are again cut and hand tufted with a second compression. Each mattress is then lovingly encased with hand sewn luxury fabrics and the final hand tufting is completed with wool rosettes. Hand Tufting is the Heart of our Craftsmanship. Hand tufting anchors mattress layers by driving a long needle and tufting straps all the way through the mattress at regular intervals. True to the lost art of hand tufting, our method involves compressing the inner spring unit of the mattress and hand tufting the layers so they hold both the fibers and the tension of the inner springs in place. Each side of our mattresses receive an inner tufting (deep in the first layers) and an outer tufting over the fabric cover. The final tufting is completed with soft wool rosettes. Why Hand Tufting Creates Better Sleep. When mattress layers form tight pockets from hand tufting the comfort is greatly enhanced. These pockets give a signature wave like effect across the surface of the mattress that evens out to perfectly support you when laid upon. Hand tufting prevents wear and tear by keeping layers in place eliminating any sagging or shifting. It also evenly distributes weight. No other method of mattress making provides this level of longevity. Hand tufting to compressed inner springs results in outstanding support that is responsive and resilient. Once you’ve slept on a hand tufted bed your back will not want anything else. Securing our natural mattress layers with tufting straps removes the need to use toxic glues that other methods must employ. Our traditional hand tufting is vastly different from machine tufting which only gives a padded or quilted surface effect. Our craftsmen individually pull together and compress our layers, first on the inside core of the mattress and then again on the outside of the mattress. We pay attention to the details so you will never have to. The luxurious feel and comfort level of a Bed By Design mattress is perfected by tuft depth and tension. You can rest easily knowing we provide a free comfort adjustment. 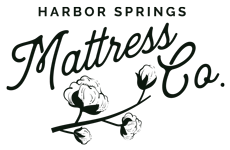 Harbor Springs Mattress Co. is proud to be one of the few companies left in the United States who still hand tuft. Why Springs Are Our Silent Work Horse. Our double-tempered, hand-assembled springs are made with alternating turn coil construction which create the distinctive, luxurious feel unique to innerspring technology. Smooth-acting coil hinge points allow independent action creating unequalled body-contour conformance. While we are big fans of snuggling in bed, we know a great bed should not force the matter when sleep is at hand. The alternating right and left turn coil design of our inner springs distribute weight for a balanced sleep surface that eliminates roll together and partner disturbance. Unlike mattresses made with only foam, our inner spring mattresses can react to body weight, shape and movement with increasing firmness. Initially, the coils respond with supple, gentle comfort, then adjust with increasing firmness, providing proper support as weight is applied. Strategic placement of coil gauge, density and spacing provide firm support in the area where 70% of sleeping person’s body weight is concentrated. At Harbor Springs Mattress Company, we often say our beds are alive. When we say this, we are really expressing our belief that a great mattress should move with you a little and support you as you move. These movements that give “life” to our mattresses are expertly crafted to perfection. They are not too much and not too little. They are just right. This level of support simply cannot be found in beds made only with foam or foam latex. True Box Springs Support You and Your Mattress. Good box springs are kin to shocks on a luxury car. We spare no detail to support the performance and durability of our handmade beds. Box springs support both your mattress and your body. Your body receives double the support with our mattress and box spring set. The truth is real box springs are becoming less common. Many bed companies sell a platform without box springs inside. Without box springs your mattress will wear out quicker. At Beds By Design, we want you to enjoy the quality of our craftsmanship for decades to come. Our box springs are carefully crafted using heavy 9 gauge steel springs. We build the strongest box springs in the industry because we give the longest warranty.